Brooker Creek Preserve is an 8,500-acre wilderness area located in the northeastern corner of Pinellas County. Bordered by Pasco County to the north and Hillsborough County to the east, the Preserve is roughly seven miles long and one and one-half miles wide and lies within the rapidly developing East Lake region of Pinellas County. Brooker Creek Preserve is a wilderness island surrounded on all sides by urban development. Brooker Creek Preserve is not a park, but a wilderness area. Management for the Preserve rests with the Pinellas County Department of Parks and Conservation Resources. 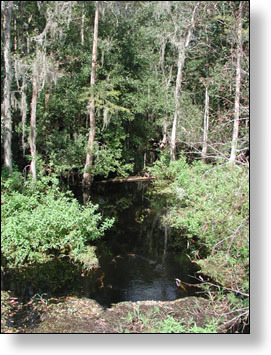 The Preserve's namesake, Brooker Creek, is the only stream that enters Lake Tarpon and is a major influence on its water quality. The numerous channels of Brooker Creek enter the Preserve from wetlands in Hillsborough County and flow through a maze of swamps and uplands within the Preserve before combining into a single stream east of Lake Tarpon. Ecologically, the Preserve is an interesting place and an important area to protect. The site supports populations of white-tailed deer, wild turkey, otter, gopher tortoise, bobcat, and coyote. 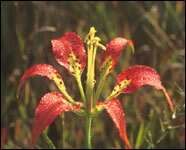 Many of these species are abundant in the Preserve but are found nowhere else in the county. Likewise, many less common species such as the endangered Catesby lily, a variety of orchids, Bachman's sparrows, and the tiger swallowtail butterfly find refuge within the Preserve. The size and diversity of the Preserve will ensure that the great diversity of plants and animals that reside there now will have a home for future generations. Starting in the 1970's through 2009, Pinellas County aquired the property which today comprises Brooker Creek Preserve. Some of the earliest purchases were targeted to protect groundwater quality around the county's Eldridge-Wilde well field. Other purchases were made for county projects that were not implemented. Development and adoption of Pinellas County's Growth Management Plan in 1989 gave great impetus to expand the acreage of conservation lands within the county. The area that is now the Preserve was targeted as the best choice. Since 1990, an aggressive land acquisition campaign was waged to tie together the various parcels that were already owned by the county and to acquire additional environmentally sensitive tracts that had yet to be developed. Although the county was reasonably successful in purchasing land through a number of means including the "Penny for Pinellas" sales tax, the greatest boost came in 1992 when the Southwest Florida Water Management District purchased more than 1,600 acres adjacent to a county purchase of nearly 800 acres at the southern end of the Preserve. Another significant boost to the land acquisition program came in 1993 when the State of Florida approved a grant request through its Preservation 2000, Communities Trust Fund Program for 13 separate parcels. The matching contribution of $1.2 million made it possible to add hundreds of additional acres to the Preserve, including the site for the Environmental Education Center. In 1995, another $1.2 million was approved by the State for additional acreage. In 1995, Hillsborough County purchased 400 acres adjacent to the Preserve and the future could hold additional acquisitions beyond Pinellas County borders. An aggressive land purchase program continues in Pinellas County while contiguous wildlands remain available. In 2009, Pinellas County added over 700 acres to Brooker Creek Preserve with the purchase of the Wilde property on the north side of Keystone Road. This land will provide a corridor for wildlife, connecting Brooker Creek Preserve with 1,000 acres in Hillsborough County and with the Anclote River corridor. This area currently is leased to cattle ranchers until money becomes available for restoration. A comprehensive management plan developed with the assistance of biologists from the University of South Florida directs a program of land management, research, and environmental education. All the while, the Preserve provides a unique backdrop for a variety of public uses. Balancing the needs of wilderness with public use is one of the great challenges of the Brooker Creek Preserve.